Centers your pots in seconds. Reliable, 3 point, spiral-based locking mechanism secures your pots on center. Will not stick to the rim of your pots like wet clay wads, or let your pot loose. Simply snaps on and off your wheel head. Comes with 5 sets of rods, to hold a wide variety of shapes and sizes. 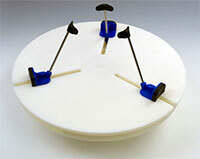 Fits any potter’s wheel with a removable splash pan or sufficient side clearance to mount a 16” (42cm) diameter plate. Designed to withstand years of continuous studio use.